Dimensions of tile. Typical tile sizes. What are the typical dimensions of tile? There is no such term as standard when it comes to tile dimensions. Tile manufacturer offer enormous variety of products from very small 0.5” x 0.5” mosaic to large 24” x 24” tiles to suit in any house design and satisfy any customer needs. It is more about the style rather than sizes and term of typical is more appropriate to analyze the dimensions of tile. What are the typical sizes of tile? Ceramic or porcelain tile typically made of rectangles 16” x 16”, 12” x 12”, 6” x 6” or 4” x 4” with different types of finishes. Porcelain tile manufacturers offer some of their products as an imitation of stone tile especially marble finish is a popular. Travertine tile often bigger in size and 24” x 24” is a good choice for quality custom made tile work. But small 3” x 3” tiles can be incorporated in design while working primary with a bigger dimensions of tile. 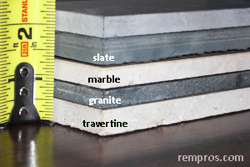 Usually 12” x 12” ceramic or porcelain tile are 1/3 of an inch thick. Same size granite or marble tile are often 3/8 of an inch. But in many cases small tiles such as glass mosaic on mesh can be as thin as 1/8 and go up to 3/8 what is typical for many stone mosaic. 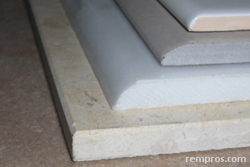 Generally bigger tiles are thicker, and 2’ x 2’ travertine is often 1/2 of an inch or approximately 13 mm thick. 15 milliliters or 5/8 of an inch tiles are very rare. How heavy the tile is? 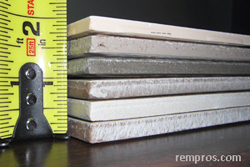 One piece of 12”x12” ceramic tile usually will weight 3.5 – 4 pounds or 1.6 – 1.8 kilograms. Porcelain tile might be slightly heavier and 1 box of 15 tiles might have 55 – 65 pounds or 25 – 30 kilograms. 1 case with a 10 pieces of 12” x 12” x 3/8” granite or marble tile typically weight around 60 pounds. Any bigger or smaller sizes will be simply prorated to get a rough idea how heavy it is. For shipment purpose it is necessary to check with manufacturer or retailer exact weight of particular product. While working on stone tile project installer can create technically any size or even shape the tile to custom design. From one 18” x 18” tile can be made four 9” x 9” or three 6” x 18”. The edges of granite, marble or travertine tile can be rounded and finished manually. Polished ceramic and most porcelain tile is not a solid all the way through its thickness, but have a protective layer on top what makes the cuts harder to “hide” because polishing is not possible due to damaging the finishing layer. Through body porcelain can be sized manually similar to stone tile. For visible sides manufacturers offer already prefabricated edges to finish the borders often know as a surface bullnose. It can be in the size of actual tile with one or two sides finished or as narrow borders typically often used as a tile baseboard. Which size of tile makes the room looks bigger? Usually interior designer will recommend using a bigger tile sizes to make the room visually bigger. But color is also matter. Using a grout the same color as a tile will “hide” the actual distinguish in between separate pieces and the appearance will be more like plain rather than seams separated. Rectangles are the most common used tile option, but hexagon, triangle, trapezium or trapezoid shapes might be used to create a unique design. Mosaic pieces of tile on the mesh often have different dimensions and create a stylish appearance as a whole. Dimensions in the chart are approximate. In many cases exact measurements can be 11 3/4 x 11 3/4 or 12 1/4 x 12 1/4 instead of 12 x 12 tile and there are no standard specifications.